Here is a simple way to measure reaction time. People who have never seen a reaction-time measurement tend to be very surprised at how long reaction times really are. The simple version of the experiment is remarkably simple. You need two people (one experimenter and one subject), plus a long ruler, plus a notebook (or computer) for recording the data. The ruler should be a yardstick or meter stick; a 12” ruler is not long enough. Move the ruler and/or the hand so that the thumb is aligned with a round number near the middle of the ruler – perhaps the 15 inch mark or the 50 cm mark. The experimenter drops the ruler without warning. The subject then catches the ruler as quickly as possible. Record how far the ruler dropped. The ruler accelerates downward. The acceleration due to gravity is the same for everything. To a good approximation it is 9.8 meters per second per second, anywhere at or near the surface of the earth. That is to say, the speed is increasing at a steady rate. At the end of the first tenth of a second, the speed is 0.98 meters per second. A the end of the second tenth of a second, the speed is 1.96 meters per second. In all cases, the average speed (averaged over the whole motion) is half of the final speed. 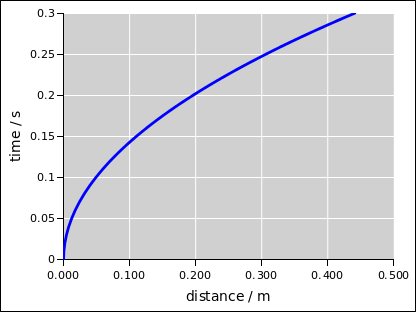 The distance traveled is the total time, multiplied by the average speed. Since the speed itself is proportional to time, the distance traveled is proportional to the square of the time. You can see some typical numbers in table 1. The relationship is plotted in figure 2.
where a is the acceleration, vfinal is the final speed, vavg is the average speed, d is the distance, and t is the time. We neglect friction and buoyancy, so the acceleration is just the standard acceleration of gravity. Note that a subject with a competitive attitude can get a lower score by watching the experimenter’s hand. That’s because the hand starts to move before the ruler starts to move. Indeed, as you can see in figure 2, a nontrivial amount of time elapses before the ruler drops any appreciable amount. Therefore, to get more consistent and reliable data, the experimenter can hold the ruler in one hand and hold a piece of paper or cardboard with the other hand, so as to block the subject’s line of sight. We want the subject to have a good view of the ruler, but not of the experimenter’s hand. The point here is to level the playing field, so that the score means the same thing for all subjects, whether or not they know the trick about watching for hand movement. Similarly, the experimenter should take care not to telegraph the upcoming drop. Also note that a subject with a competitive attitude can get a lower score by moving his hand downwards before catching the ruler. Therefore, to get more consistent and reliable data, use a different setup. Set a cinder block on a table, slightly overhanging the edge of the tabletop. Dangle the ruler next to the cinder block. 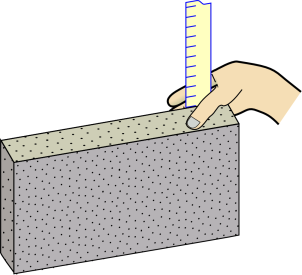 The subject is asked to trap the ruler against the side of the cinder block, as shown in figure 3. This has a couple of advantages. For one thing, the block isn’t going to move up and down. Secondly, the top of the block provides a relatively clean reference line for reading the ruler. Repeat the experiment several times for each subject. Record all the data. Recognize that there is a learning curve. You can account for this during the analysis, by looking at how well the subjects do after they have practiced a few times. As a general rule, excluding the results from “practice runs” must be done very carefully. Any time you exclude data from the analysis, you are changing the experiment. Beware that if this not done properly, it introduces nasty biases. In the ruler drop experiment, it helps to imagine we are doing two different experiments for the price of one. We are measuring two different things, namely the reaction time of a naïve subject, and the reaction time of an experienced subject. The results should be clearly labeled accordingly.